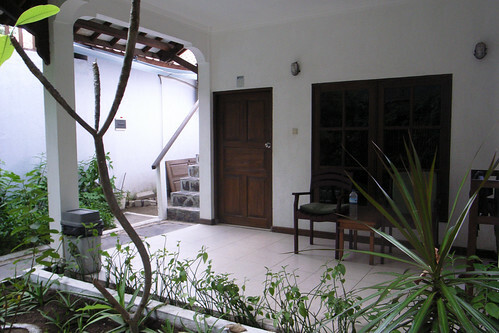 I left Legian at around 9 AM on Monday, and I took a taxi to the Perama office in Kuta from where I took a bus to Padangbai, in order to take the ferry to Gili Trawangan. 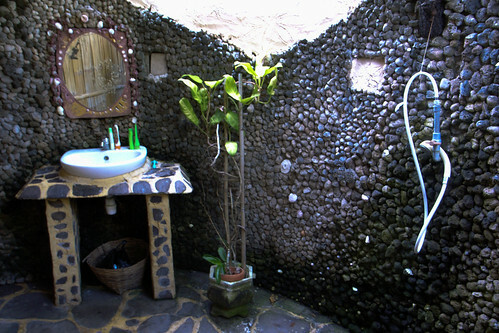 The bus ride took over 2 hours because from Kuta went to Sanur, Ubud then Padangbai. It was one of those tiny buses, comparable to a small school bus. 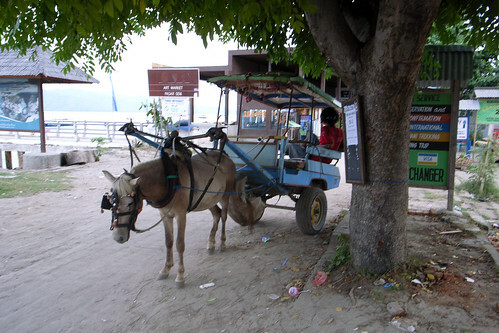 Initially, there were only a few people on board but it filled up entirely in Ubud. The girl sitting next to me was Stacey from San Francisco. 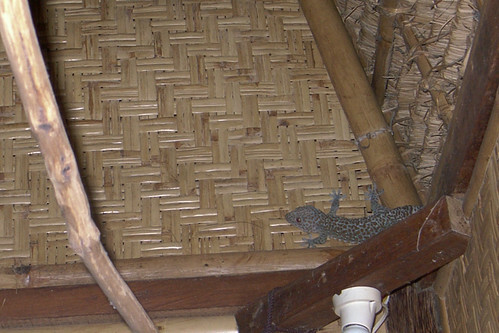 She had moved to Ubud 3 months ago and was planning on staying another 6. We had a nice talk. Stacey on the Perama boat to Trawangan. Then in Padangbai we had to get on a tiny little motorboat and for a moment I was afraid we’re gonna have to take that all the way to Trawangan, which is a 4 hour ride. 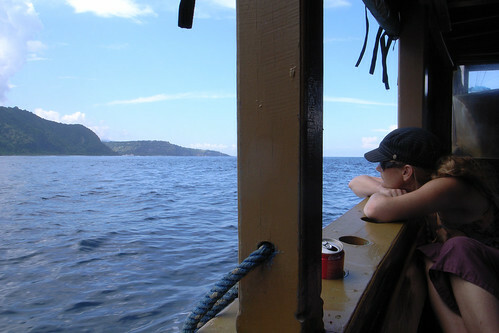 Thankfully no, they took us to a fairly large and comfy Perama boat, which couldn’t dock at Padangbai harbour. 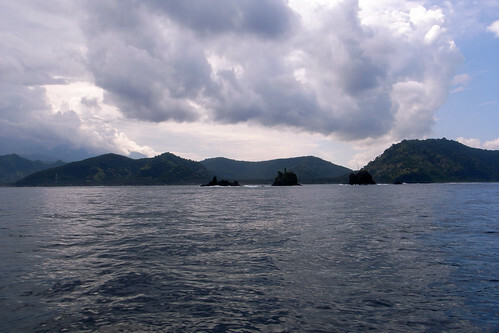 Bali coast, as seen from the boat to the Gili islands. The ride was great. It wasn’t busy on the boat and they had several areas, including a beach on top. They fed us rice, mie, chicken, tempeh, watermelon and pisan goreng (battered, deepfried banana). Quite yummy. We reached Trawangan around 6 pm and it was the same story. The boat couldn’t dock so we were taken to the island by tiny motorboat. 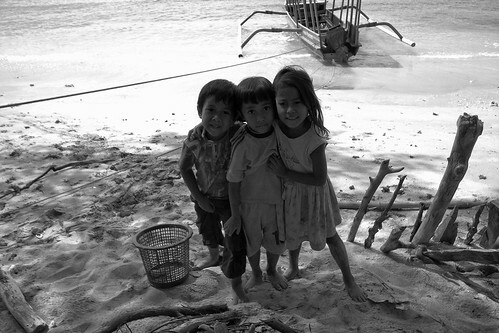 From there you kind of had to wade ashore yourself, though they did take our luggage off and took it to the beach. 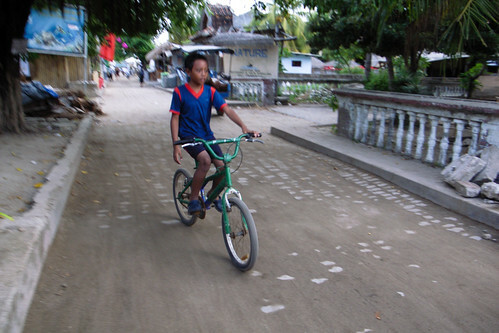 The beauty of this island (as well as the other gili’s) is that there is no motorized traffic. Only horse drawn carriages, bicycles and people walking, which makes it really quiet. There’s also no dogs here, but there’s a ton of cats. Most of them very skinny and lots of them with no tail or half a tail. Some are friendly, some are scared but they are everywhere. Just like chickens that randomly roam the streets. I walked the little road to my hotel; Tir Na Nog, which is at the South end of the island, where the biggest bars and restaurants are. My room is fantastic. 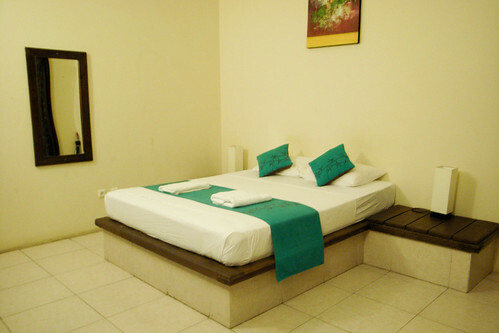 A big queen size bed with nice clean linens, a big Indonesian style dresser and a huge bathroom. 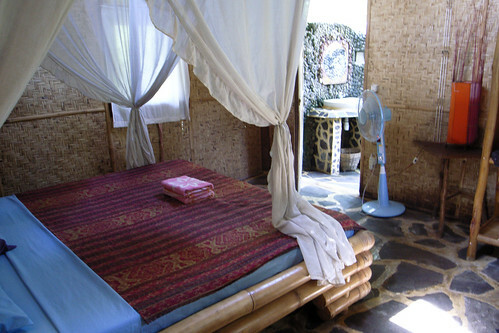 The whole room is done in brown (wood, curtains), white towels and bedsheets and little aqua coloured throw pillows. It’s very clean and modern. Bonus, my room is at the very back of the little lane of rooms so it’s very quiet. Right next to me is the private villa. I had a quick peak. Beautiful. Huge glass sliding doors, private garden and pool. 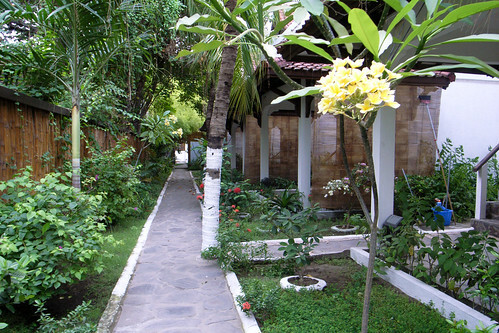 I think it’s 125 USD a night, which is a pretty sweet deal if you’re sharing with a few people. Tir Na Nog cottages. Mine was at the very end of this little lane. My room at Tir Na Nog. The hotel bar I didn’t find that interesting, so I went a few doors down to Scallywag’s. Great chill out place. 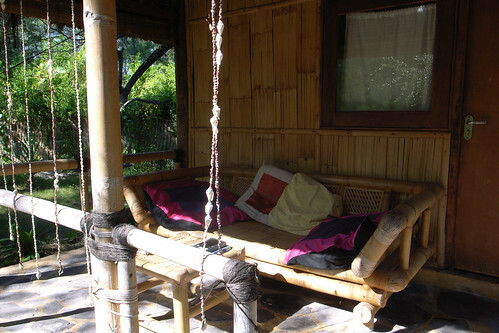 I was enjoying some Bintangs in a huge rattan chair with a ton of pillows. Went back to my room pretty early because I was slightly tipsy and exhausted. This morning I went for breakfast at ‘Coco’s’. Had some good coffee and a baguette with egg. 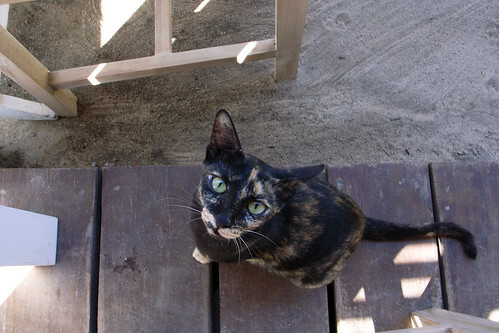 It came with a piece of bacon, which was gladly received by one of the many stray cats here. She decided she liked me enough so she jumped on my chair and snoozed there while I ate. 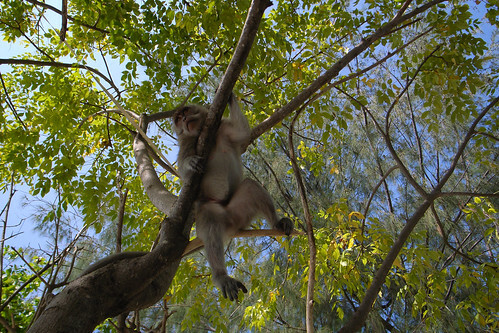 After breakfast I decided to do the tour of the island by foot. 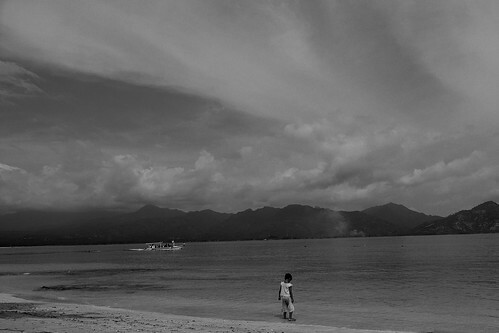 I walked all the way around the island while only stopping for a few swims at entirely deserted beaches. The beach on the West side isn’t the greatest though. It’s very narrow but the water was clean and warm. After all that walking I reached the East side, which is my favourite side of the island. There’s little bars and food stalls and some great snorkling. 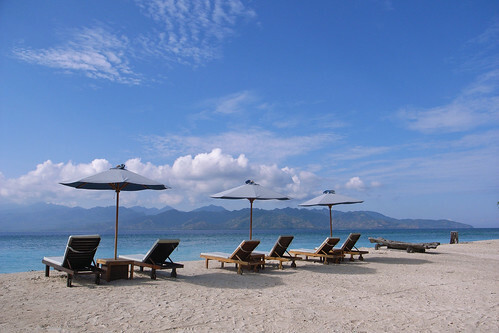 I came to the Gili’s to do some snorkling and snorkling I did. I rented a mask and fins and one of the guys from the dive shop took me a few hundred meters north to watch the turtles. What an amazing sight. Other than the turtles there were lots of brightly coloured fish. The water was very clear and it was a real treat. Very tiring though. I swam and walked a lot today. So I had a late lunch at a ‘warung’, which is a tiny little restaurant with a few tables outside. 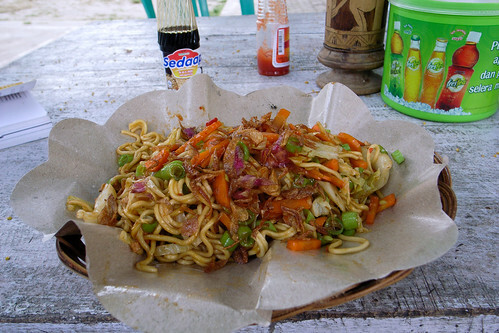 Mie goreng, which is fried noodles with veggies. It was very hearty and spicy and cost me less than a dollar. Can’t go wrong with that. Back at the room writing this. There’s no working wifi here anywhere and the internet cafes are a nightmare. Tiny, slow connections and incredibly hot. 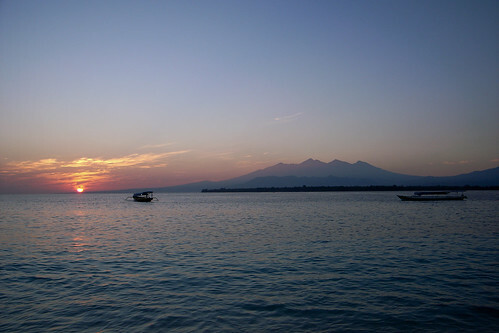 Though I do like it here, I am leaving tomorrow morning to go to Gili Meno for a few days. 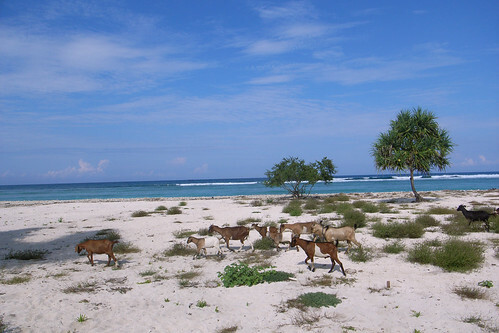 Then Gili Air. 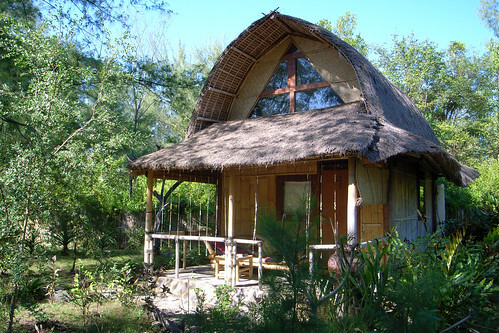 I want to see all three gili’s then decide where I want to stay.